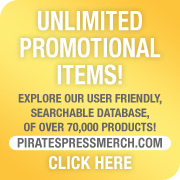 Whether they are used to market another product or hand out on their own as a standalone marketing tool, Pirates Press is your place for stickers. We offer every kind of sticker you can imagine at great prices with quick turnaround! We offer a HUGE variety of stocks and adhesives, endless printing options, foil stamping, printing on the liner, a HUGE catalog of (standard) sizes and shapes and even custom shapes and sizes! USING THREE DIFFERENT PRINTING TECHNIQUES, WE OFFER THREE TYPES OF STICKERS – TYPE A, TYPE B & TYPE C – THE THREE TYPES OF STICKERS EACH HAVE THEIR OWN OPTIONS! TYPE A – Printed in big batches on a large-format offset printer, these stickers can only be single sided and square-cut, CMYK printed, only available on high quality crack-n-peel paper stock with a UV (gloss) coating. An amazing value, especially for larger quantity orders. These are the most economical, high quality, FULL COLOR stickers we offer, but they will fade in direct sunlight over time. CLICK HERE FOR MORE INFO. TYPE B – Printed on high quality label printers, these contain our largest selection of sizes, finishes, stock and ink options. 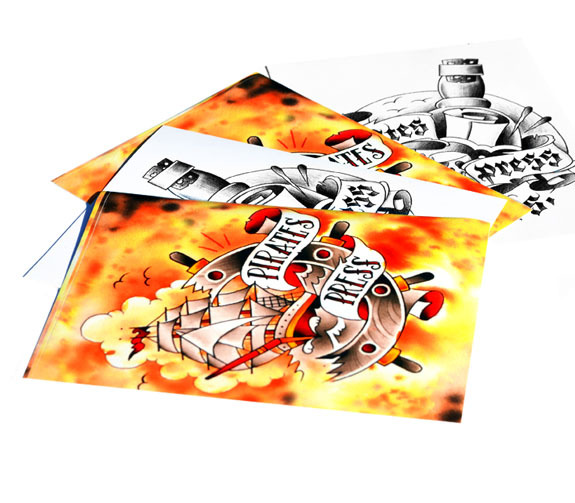 These offer a number of different paper stock options including glossy or matte paper, weatherproof vinyl, metallic foil and clear stocks, as well as the ability to print on the backs (liner printing). This option also offer PMS, glow-in-the-dark, foil and scratch 'n' sniff printing options. Clearly our most versatile stickers, these are the best options for printing high-quality stickers, as well as fancier (marketing) stickers to be applied to your next vinyl or cd project. CLICK HERE FOR MORE INFO. TYPE C – Printed digitally on pre-cut label paper, these are our cheapest stickers. We can print black and white or full color, on the standard semi-gloss paper stock. This option is primarily used when printing black and white stickers, especially "download included" and barcode stickers, which are often immediately removed and discarded. This is the best option for inexpensive black and white stickers, such as barcodes, to be applied to other products. CLICK HERE FOR MORE INFO.